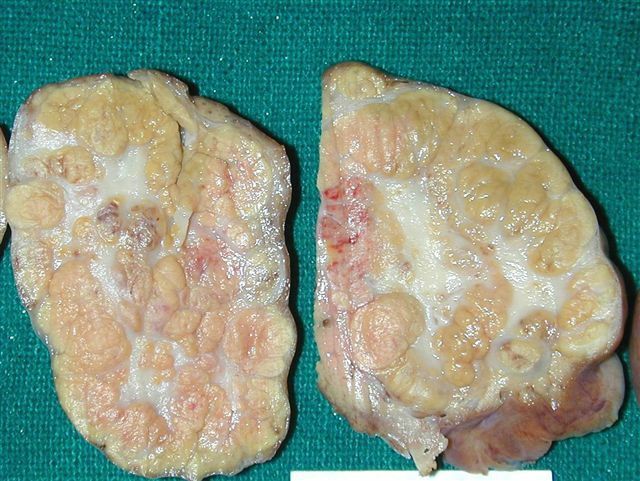 We thank Dr. Hanni Gulwani, Sir Ganga Ram Hospital, New Delhi (India) for contributing this case and the discussion.� To contribute a Case of the Week, please email info@PathologyOutlines.com with attachments of microscopic images (any size, we will shrink if necessary) in JPG or TIFF format, a clinical history, your diagnosis and any other images (gross, immunostains, etc.) 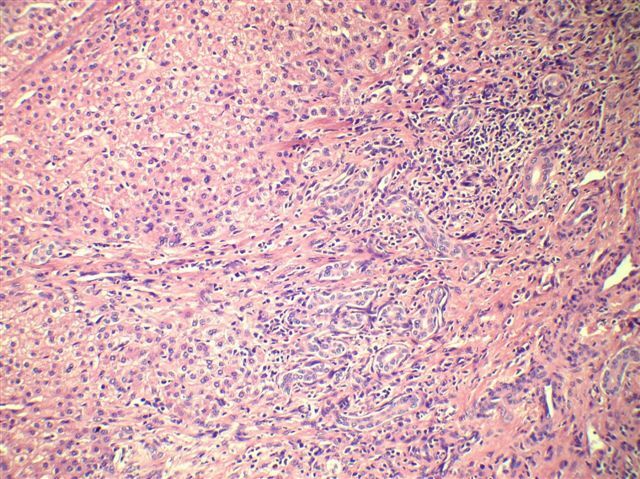 that may be helpful or interesting.� We will write the discussion (unless you want to), list you as the contributor, and send you a check for $35 (US) for your time after we send out the case.� Please only send cases with a definitive diagnosis. 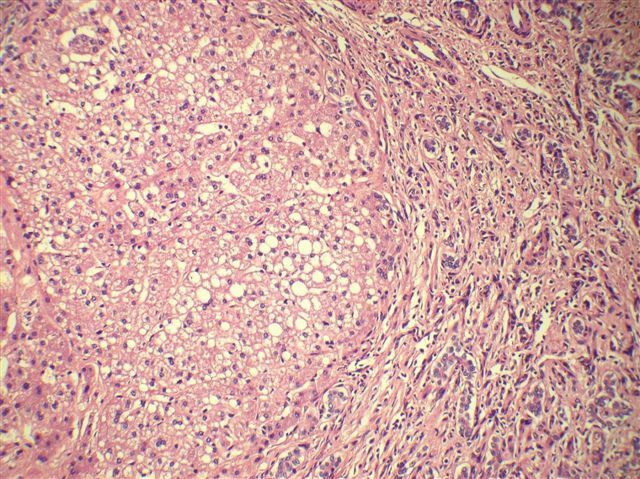 A 13 month old girl had an incidental liver mass that was excised.� Clinically, it was thought to be a hepatoblastoma. 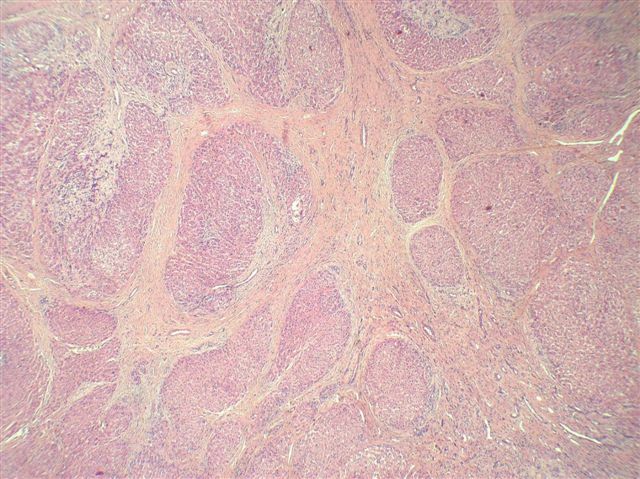 This tumor characteristically is a solitary (80%), subcapsular, nodular and bulging mass, light brown to yellow (usually lighter than the surrounding liver), with a central stellate scar from which broad fibrous septa radiate outwards (figure 1).� It is usually well circumscribed, but not encapsulated.� The normal liver (N) has a smooth cut surface (figure 2). 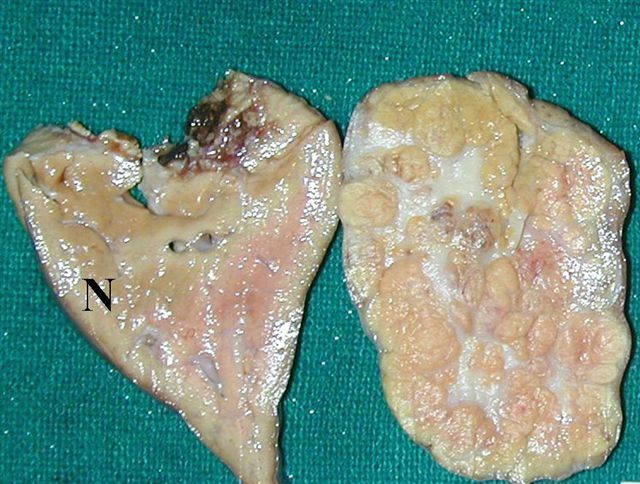 FNH is a benign condition.� Pediatric patients are usually treated conservatively.� Adult women should discontinue oral contraceptives, if applicable.� Surgery is indicated for symptomatic patients, complications, compression of adjacent organs or lesion progression (Eur J Pediatr Surg 2006;16:235).